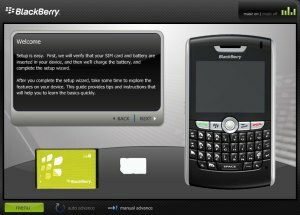 Blackberry 8800 Interactive Demo | BlackBerry Blast! Are you a pure Blackberry novice? Have you just purchased a Blackberry 8800 and now you feel lost? Well you can mosey over to the Blackberry 8800 demo siteto run through the interactive demo. They don't have it linked up very well but perhaps they advertise it most in the documentation. In any case, just follow the link below for the interactive demo. You'll learn all about your sim card, battery, email setup, applications, etc., etc. Check it out!